I do product reviews a few times a year when I find something good. Martial artist's need good shoes. Zero-drop. That means they are level, they don't have any raised heal. I don't want a heal messing with my balance or my structure. Large Toe Box. Space for my toes to spread or curl. Arch support or other weird stuff inside the shoe. I have high arches, it is just in the way. A rounded or tapered sole that makes it difficult for the toes to touch the ground while standing. For the last few years I have been happy with Merrell's barefoot-running line. I've had several different pairs and they were good. But this year they made the toe-box smaller and a bit pointy. Oops. Lost my business. I'm now wearing Altra's and loving them. Altra Torin's: Zero-Drop and the best Toe-Box Ever. Merrell's come in a variety of sole thickness, or cushioning. At first I wanted the least amount of cushioning because I was hip to feeling the earth. But a lot of my practice and just general walking around is on hard ground so over time I became more open to more cushioning. But when I first saw Altra's I thought, no way, too much cushioning! I won't be able to feel the ground. But a friend had a pair in my size and when I tried them on I was amazed. These shoes are made for hard impact and control. My feet are perfectly flat on the ground the way I want them for control and balance, and yet I can stamp the ground without feeling shock. There are some amazing shock absorbing materials out there for motorcycle armor and I think Altra is putting them in their shoes. The other thing that looked like a problem was that the toes are not quite touching the ground. In many shoe lines that means the bottom of the shoe is bowed in order to slightly rock you forward which is annoying if you do martial arts. But Altra's are totally flat, when I wear them it feels like my toes are on the ground. They are tapered so you can tip up on your toes for running--like the opera shoes. All Altra shoes follow my first two rules above. Some of them have even more cushioning than the "Torins" I got. I'll try Max Cushioning next time I buy shoes. They also have a trail-running shoe with treads that look cool. The funny thing is that they look like Chinese Opera shoes, don't they? I always wondered what it would be like to do martial arts in those elevated Opera shoes, it looked like it might be a problem. But now I know that more elevated cushion is actually better! 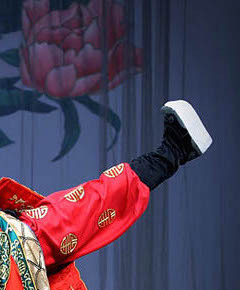 Chinese Opera styling, maximum cushioning, best toe-box available.